The Statistics Add-in for Excel (StatFi) is specifically designed to improve the statistical analysis capabilities of Excel. While basic statistics can be calculated within the embedded functionality Excel, the precision of results and reliability is not optimal as Excel is not primarily designed for statistical data analysis. 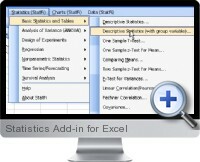 The Statistics Add-in for Excel expands the statistical and analytical abilities of Microsoft Excel by adding precise calculations and reproducible results with ISO compliant implementations of complex statistical calculations. The add-in can perform advanced statistical calculations for a wide range of analytical requirements such as those needed for data forecasting data and trend identification for prediction. T-tests, Pagurova Criterion and G-Criterion analysis. Correlation coefficients (Pearson, Fechner) and co-variation. ANOVA (MANOVA, GLM ANOVA and Latin squares analysis). 2x2 Tables Analysis (Chi-square, Yates Chi-square, Exact Fisher Test and more). Rank correlations (Kendall Tau, Spearman R, Gamma and more). Comparing independent samples (Mann-Whitney U Test, Kolmogorov-Smirnov test, Wald-Wolfowitz Runs test, Rosenbaum Criterion, Kruskal-Wallis ANOVA, median test). Comparing dependent samples (Wilcoxon Matched Pairs Test, Sign Test, Friedman ANOVA, Kendall's Coefficient of concordance). Regression analysis (Multivariate, Logistic, Stepwise, Polynomial, Cox proportional-hazards). Probit analysis (LD50, LD50 SE, Cumulative coefficient, LD100 calculation).